Tomasz Sikorski was born om May 19, 1939, in Warsaw, where he died on 12 November 1988. 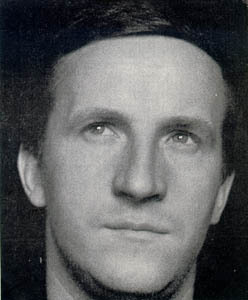 He studied music at the State Higher School of Music in Warsaw – compositions under Kazimierz Sikorski and piano under Zbigniew Drzewiecki (1956-62). From 1965 to 1966 he was in Paris on a scholarship granted by the French Government. In the years 1975-6 he was a recipient of a scholarship granted by the U.S. Government (Senior Fulbright Program). During this period he worked at the Columbia-Princeton Electronic Music Center in New York, his composition Solitude of Sound being the result of his work there. At very beginning of his career as a composer, Sikorski clearly defined teh path he would take and never departed from it. What he always found the most important was the sound itself – the acoustic object with its initial phase, its resonance, its vibration and its inner substance. His primary interest was always in the tonal gesture, the sounding phenomenon and pinned them to a piece of paper rather as some people pin butterflies. Indeed, Sikorski’s musical compositions have something of the character of collector’s albums. Sikorski’s compositions have been frequently performed at the International Contemporary Music Festival “Warsaw Autumn” and at the Festival of the International Society for Contemporary Music – in Stockholm (1966), Athens (1979) and Brussels (1981), as well as in many other European countries, in America and Japan.